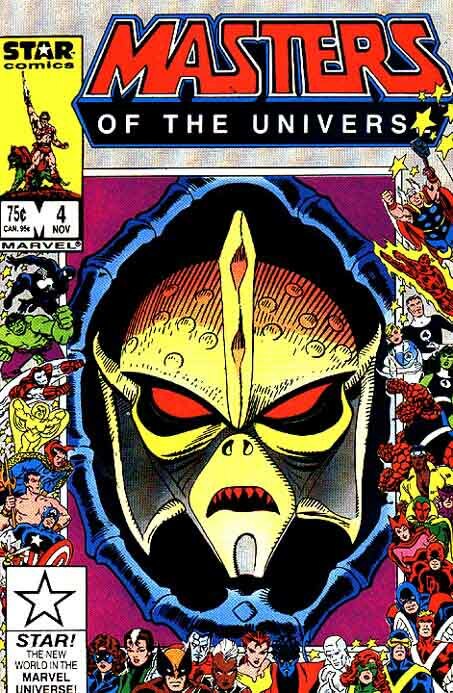 Unfortunately, Hordak is only on the cover. Speaking of which, this is – of course – one of the Marvel 25th Anniversary cover! Just like the Transformers issue, Carlin does a great job of introducing the characters by having everyone state their name or address the other person by their full time. Sometimes both. 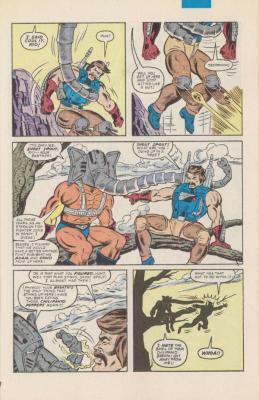 Issue opens with Prince Adam and Orko having a friendly competition with Rio Blast and Snout Spout. I feel like I own Rio Blast’s action figure but I know for sure that I own Snout Spout, Prince Adam and Orko. Seeing Prince Adam’s sword, took me right back to being a kid and how the art team did a great job of making everyone look just like their action figure plus accessories! Rio Blast mistakes Snout Spout’s nose for a snake and we get the first of three references (in two pages!) that he really hates snakes. Which makes sense as Indiana Jones in the Temple of Doom is still fresh on people’s mind. Rio Blast isn’t going to have a good time as this issue is titled, Snakes Alive! At one point, Prince Adam calls Orko, Ork and that doesn’t seem right. Did he do that on the cartoon? I get that it makes it seem like they are friends but it sounds wrong in my head. So the winning duo are named, but they keep bickering with each other. Meanwhile, at Snake Mountain. Which is the right name, but looks nothing like the cartoon. 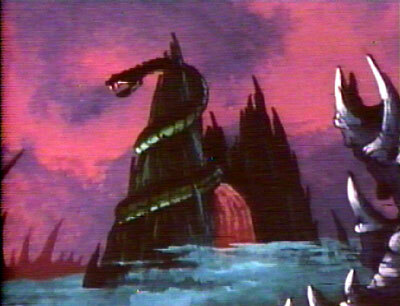 Here it is like a small village, whereas the cartoon has it being a giant mountain, the shape of a snake. Skeletor is tired of coming up with all the schemes. He brings in Kobra Khan. He tells Skeletor about the legendary Snake Men. I own these toys – King Hiss, Tung Lashor and Rattlor. Kobra Khan came with a pack on his back that would spray water. King Hiss, from the waist up, will break off – revealing a torso of snakes. 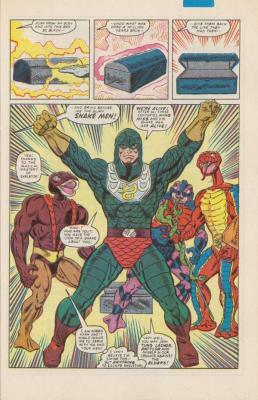 The Snake Men agree to help Skeletor find He-Man, in hopes that the hero will help them thwart Skeletor and they can be the Masters of the Universe. They find our heroes and capture Cringer. Adam was about to transform when Rio Blast and Snout Spout shows up to help. The duo split up and Adam does his thing. How amazing does that page look? Wilson and Janke really did an excellent job with this entire issue. The duo even split up from each other, they bicker that much! Orko, unlike the cartoon, is able to successfully perform magic and teleports the two to Snake Mountain. I owned Castle Grayskull and my wife was cool enough to own Snake Mountain. If only we knew each other then. We also own She-Ra’s palace. 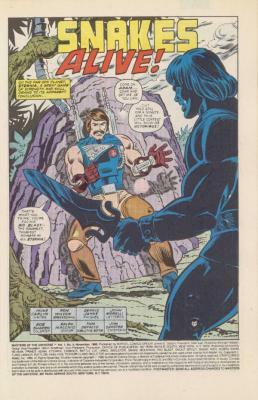 I also owned Skeletor’s two gauntlets, Snap-Dragon. 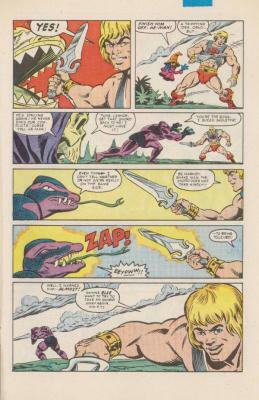 He-Man gets distracted by the Snake Men and Skeletor grabs his sword of power. The duo are now regretting splitting from each other, almost as if there is a lesson there! Skeletor sends the Snake Men to fight the duo. The heroes, once united, defeats them. Rio Blast is able to overcome his disdain for snakes. 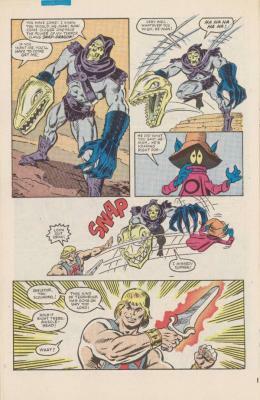 Orko casts another spell, giving He-Man, his sword back. Orko wants He-Man to kill Skeletor. He-Man isn’t going to do that. Weirdly, Skeletor says aloud, “He is stalling! He never ends our conflicts. Curse you!” Does Skeletor want He-Man to kill him? Bizarre! There is a page of Spider-Man saving a kid who was trying to crawl down a wall. Don’t do that kids! The Snake Men leave. Snout Spout grabs Skeletor, but he vanishes. The day is saved. Pretty good issue, brought tons of memories back for me. Now I am in a mood for more He-Man! This website has the entire comic, you have to work to read it in page order but still, a great resource. I can’t do a He-Man post without having the awesome theme song represented! Thanks to YouTuber Its a Blast from the Past for hosting the video! 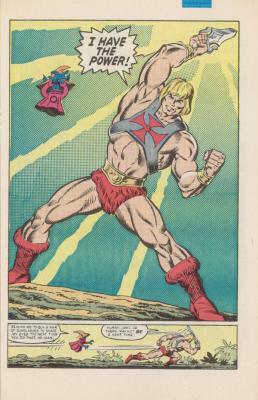 Also, one of my favorite aspects of the franchise is the He-Man / She-Ra Secret of the Sword origin story. Mostly for the incredible song that I can never get tired of, and I am happy to finally have an excuse to post it on here. Thanks to YouTuber silvap for hosting it! Love how the film makers went all out to make the opening sequence feel like a real movie. So cheesy but I love it so much. YouTuber gutz1981 compiled the entire movie and put it on YouTube. That’s pretty thoughtful! Not as cheesy as the Christmas special. Oh man, that is terrific too! YouTuber He-Man Official is hosting that video as well! I remember learning that He-Man’s mother is from Earth blowing my mind. I’ll end this revisit to my childhood mentioning the Masters of the Universe with Dolph Lundgren and a young Courtney Cox. Thanks YouTuber kegorogers for hosting the movie trailer. The film is okay, and I get why Orko and Battle Cat are not present and that they had to get Earth involved as non-cartoon lovers wouldn’t see a movie based entirely on the children’s cartoon. If you watch it as if it was a lame adaption of a beloved animated series or as a weak Jack Kirby’s Fourth World film. Apparently they are in development for another He-Man film but I will believe it once casting officially begins. There has been additional He-Man cartoons. Thanks to YouTuber joezilla1995 for hosting this video, bless you! Thanks to YouTuber CartoonIntro, the animation is very good! The 2002 series, which was interesting but I couldn’t get over the fact that I may be too old for it now. Plus, I feel like Cartoon Network moved it around the schedule too much and I didn’t have a DVR to just record new episodes easily. Now, I could totally follow it.